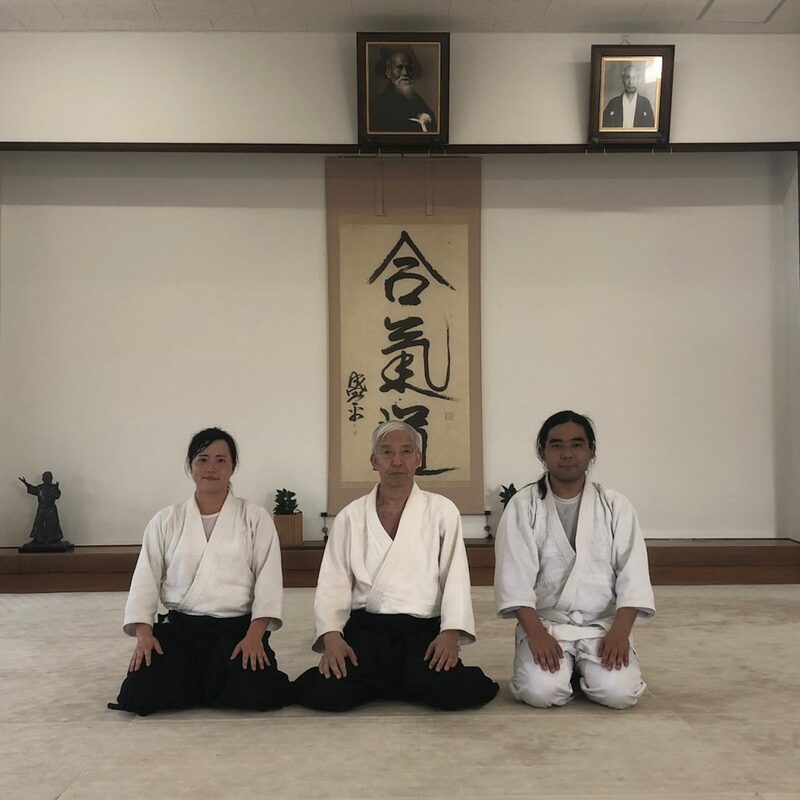 During a recent visit to Japan, Sano sensei and Julien had the opportunity to train with former Salt Lake Aikikai dojo-mate Ishida Tsuyoshi at the Aikikai Foundation World Headquarters Hombu Dojo. 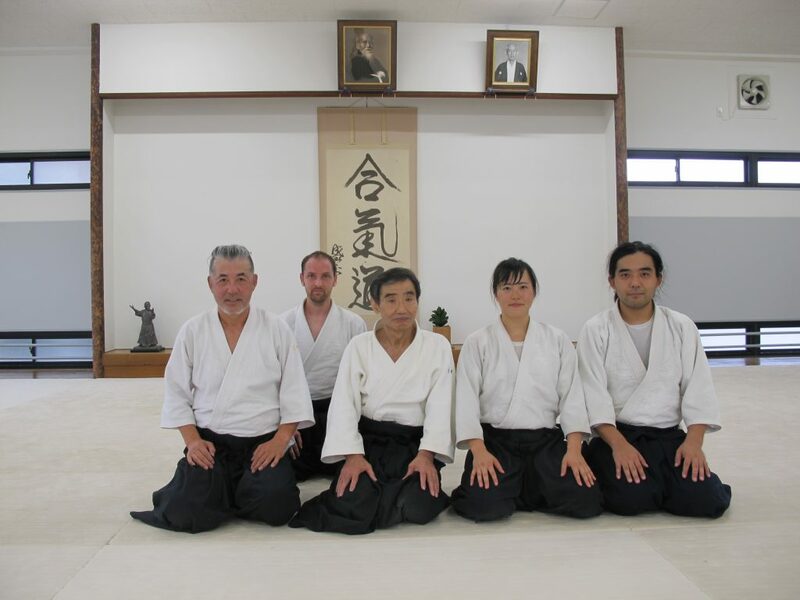 Following keiko, they had the opportunity to be photographed with the Doshu, Ueshiba Moriteru. Keiko also provided the opportunity to train with other friends of the dojo including Aikawa sensei and Matsuoka Hiromi san. Salt Lake Aikikai regular, Tsuyoshi Ishida, recently moved back home to Japan where he joined Hombu dojo to continue his training. While we were saddened to lose such an excellent training partner, we are excited for this new chapter in Tsuyoshi’s life. 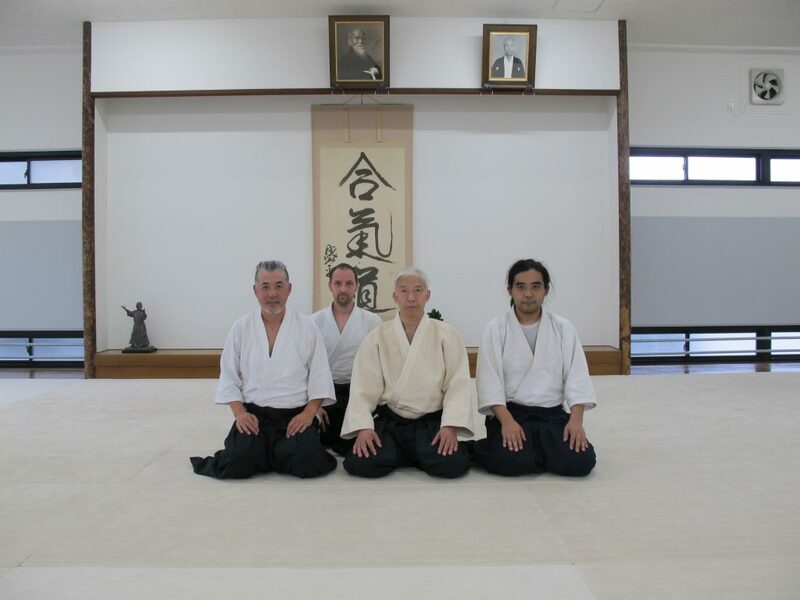 We were also happy to see dojo friend, Hiromi Matsuoka san in the photo with the Doshu that Tsuyoshi sent us. Airline: I used www.kayak.com to book my flight. I flew from Salt Lake City to Los Angeles on Alaska Airlines and from L.A. to Tokyo (Narita Airport) on Singapore Airlines. The reverse on the return trip. Notes: I highly recommend Singapore Airlines, it was by far the nicest flight that I have ever taken. Nice entertainment, two meals and plenty of snacks, decent sized seats and all around great service. Cost: Included with the price of my Japan Rail Pass. Current price for NEX is ¥4000 round trip and ¥3300 one-way. Notes: The best way to get to your hotel from Narita airport and back has a number of variables. Where you are going? When? How much you want to spend. Do you have a Japan Rail Pass? How long are you staying? The most cost effective is the regular train, but not nearly as comfortable, especially with luggage. Both the Narita Express and the Keisei Skyliner were very comfortable with reserved seats and plenty of space to put your luggage in shelves at the front of each car. The downside to all of these methods is that none of them go directly to most hotels, at least not to mine, so they require transferring to other trains, subways or buses. For example, I took the Keisei Skyliner to Nippori station and transferred to the JR Yamanote line to Ikebukuro and then switched to the Fukutoshin subway line to get to my final destination of Higashi Shinjuku station. They sell them in 7 day, 14 day and 21 day vouchers. When you get to Japan, you take the voucher to a JR office and get your actual Pass and tell them when you would like it activated. Cost: $262, $418, $535 (7,14,21) currently. You can also upgrade to a Green Car pass, which is kind of like first class, the seats are bigger and they give you a disposable wet cloth when you get on the shinkansen. The cars are typically less crowded as well. I splurged and bought the green car pass ($567/ 14days). It was really worth it on one regular train that had green cars. I was exhausted after a long day of visiting temples and was returning during rush hour. Instead of being crammed into a car comparable to a TRAX car, I was sitting in a reclining Greyhound Bus like seat. Considering it was a 1 ½ train ride, it was nice, but definitely a splurge. You can buy pre-charged cards that you then just swipe as you get on and off subways, trains and some buses. You can even use them at some vending machines and stores. I bought one pre-charged from the same place that I bought my JR Rail Pass. They both work almost identically. I got the Pasmo card and I would say that in the two weeks that I was there I probably loaded ¥4000 yen on the card to use for mass transit and some snacks. The upside is that you don’t have to buy individual tickets every time that you take the subway or train. The downside is that I probably wasn’t as efficient as possible in all of my travel itineraries. I willingly paid a little extra for the convenience. The most affordable way that I found to convert dollars to yen was also the most convenient. Using ATMs. There are several ones that you can use at the airport to draw money, but the most prolific are from Seven Bank, which can also be found in all of the 7-11 stores. I bank at America First Credit Union and was charged $1.50 for each transaction. I was still subject to my US withdrawal limit of $500 per day. I took out ¥50,000 3 times ($461.35, $459.75, $459.75) and ¥30,000 once ($276.24). The ATM gave me ¥10000 bills. I found that a good way to break them was to add ¥1000 to my Pasmo and insert a ¥10000 bill. Even though it is a cash based society I felt bad paying for a $5.00 lunch with a $100 bill. I stayed at the E Hotel Higashi Shinjuku. It is located adjacent to the A-1 exit of the Higashi Shinjuku metro station (Oedo and Fukutoshin lines). It is only a 10 minute walk to Aikikai Hombu Dojo. The accommodations are small, but adequate. The shower was hot with nice pressure, the bed was firm and comfortable. There was a TV, desk, mini-fridge and a bedside table. They left instant tea and two bottles of water everyday. The air conditioner worked fine and quickly in such a small room. There are no dressers or closets, so you are living out of your suitcase. They also had laundry facilities which were very convenient. I was pleased with the hotel, but I wasn’t expecting much. It was no frills. There are plenty of places to eat in the vicinity, including a McDonald’s across the street and a Tully’s coffee bar on the first floor of the same building as the hotel (separate entrances). Cost: The nightly rate fluctuated over the two week that I was there, but it averaged about $89/ night. They have very good information for visitors on their site. It is actually a pretty simple place. You remove your shoes before you enter, slippers are not necessary. Pay or drop off your membership card at the front desk, the men’s changing room is on the 3rd floor. There are lockers that you can use for a refundable ¥100. In the back of the dojo there is a board with hooks for you to hang your locker key during class. There are also showers. Beginners classes are on the 2nd floor and regular classes are on the 3rd floor. For the beginners class enter through the left door, bow to the shomen from seiza, and then go to the back of the dojo to stretch. The rest is pretty standard. Try to help sweep the mats after class or help wipe down the wooden floor around the mat. One thing that I noticed is that they are a bit more formal there. All of the bowing was done from seiza, before and after the technique. After class you also make an effort to bow to and thank everyone that you worked with that day. Hombu dojo is not air conditioned, keep this in mind when you choose your gi and the time of year that you decide to go. In late May and early June, it was already hot and humid. I can’t imagine training there in July or August. When done changing, return to the 1st floor and pick-up your membership card and retrieve your shoes. Cost: ¥10800/mo. or ¥1620/ day. Keep in mind the monthly rate is by the calendar so if you do as I did and go over two different months it can be more expensive. This is a beautiful dojo located in the Sakura Sports Center that they also use for judo. This is the dojo where Gerry took his Shodan test and Jon took his Nidan test a few years ago. They were all very friendly and I highly recommend a visit. We went for the Sunday classes from approx.. 9:30am – 11:30am. Let me begin by saying that there is no Diet Coke or Diet Pepsi in Japan, they have Coke Zero and something called Pepsi Strong so plan accordingly if you are addicted. Food was very affordable and abundant. There are many different choices from American fast food to Japanese street food and fine dining. One of the differences is the role that the Combini plays. They are all over the place and there are several different chains (7-11, FamilyMart, Lawson’s, etc.) They all carry lots of premade food and drinks and snacks. Some even have seating. The food isn’t bad. I had the best corndog of my life at a 7-11 in Tokyo. They have pastries and sandwiches as well as many types of bento. Cost: Food was cheaper than I expected. Meals ranged from ¥350 for a Chicken McMuffin, hashbrown and soda at McDonalds to ¥4000 for a very nice Tempura meal. I probably averaged about ¥800 – ¥1000/ meal. Tonkatsu w/rice, pickles, miso soup and cabbage salad ¥690. Tonkatsu curry w/rice and pickles ¥890 add an iced tea or coffee for ¥108. So, you get the idea. Vending machines are everywhere and range from ¥100 -¥350 for most drinks.